We hate to say it, but we're well past the apex of Summer and it's now time to start thinking about fall. Not that there is anything against Fall or Winter, but it's a good time to freshen up your look and keep a seasonal theme going be it in your place of business, maybe your school or even your city. We have all kinds of options to help you keep up to date! One big way to make the most of the indoor months are trade shows! You get to network with people looking for your goods and services and you want them to have a little take away item so they remember you. A business card is important, but so is something that is useful, practical and easy on your budget! Our promotional products page is a great place to do a little shopping for some personalized goodies from pens to personal health care items like germ prevention and we can even take a look at your need for some company Christmas items that will make a splash with your employees and customers. 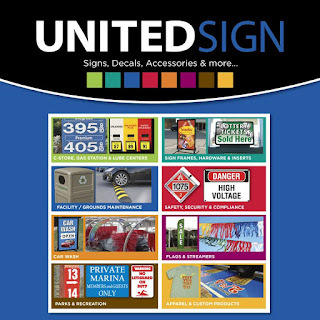 Click on the United Sign logo below to go directly to the promotional items page and happy shopping. We appreciate you taking a look!